Tranquilly lying at the south foot of Tianshan Mountains, northeast margin of Tarim Basin, Korla looks like a pearl strung with the rippling Kongque River. Korla is among the first batch of National Excellent Tourist Cities boasting many places worth seeing. The Kongque River springs from the Bosten Lake, pouring constantly over the west side of the lake. It was once an important river into Lop Nur nurtured the Ancient City of Loulan which is in full flourish two thousand years ago. Tiemen Pass (Iron Gate) garrisons the outlet of the steep gorge in the upper reaches of Kongque River in north suburbs of Korla. It was once the fortress on the central route of the ancient Silk Road. Another historical relic worth a visit is the Subashi Ruins which bears witness to the years of changes, the stories of Buddhism and the development of civilization in this vast land. Present Kongque River zigzags some 300 kilometers (186 miles) through the city center of Korla, tightly connecting the ancient Loulan civilization with Korla, a famous modern oil city in West China. 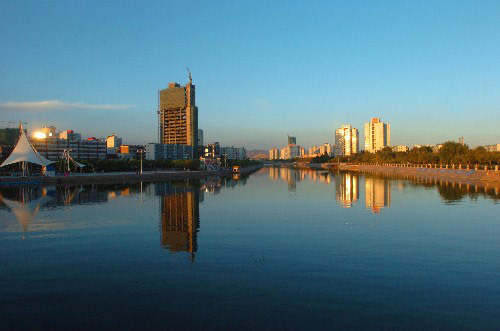 In recently year, the city government has built four parks, five bridges and seven scenic spots dotted on the 10 kilometers (6.2 miles) tourist belt along the river. Longshan Mountain of Longshan Park is located at the highest point in northeast corner of Korla, which is a perfect location to have an aerial view of the whole city. Embraced by flourishing green, the park has become a popular spot of the city. Tiantang Grand Canyon is located in the depth of mountains, some 30 kilometers (19 miles) away from the north mountain of Kuerchu Farm. Because of the trackless forest, sophisticated and unspoiled natural landscape offer good environment to have a wild adventure. Roaring waterfalls are the most spectacular in the canyon. Among the fourteen waterfalls, the highest one is 400 meters (1,312 feet) tall. Nature sceneries around Korla are unique and astonishing, including the vast choppy Bosten Lake in Bohu (Bagrax) County, world famous Lop Nur, multiform Yadan (Yardang) Spectacle in Ruoqiang (Qarkilik) County and broad charming Bayanbulak Grassland in Hejing County. Only 95 kilometers from the Bayabulak Grassland, Gongnaisi Forest Farm is an immense propagation mine with unique scenery in different seasons. There are lakes and snow mountains, flourishing vegetation, rare herbs and curative spring. Apart from those above, there are also many other wonderful sights around the city. Tarim River is a large piece of oasis in desert. Primitive diversifolious poplar (Hu Yang) trees contribute to an 'eight hundred li green corridor' in Yuli (Lopnur) County and 105 kilometers (65 miles) from the city district of Korla. 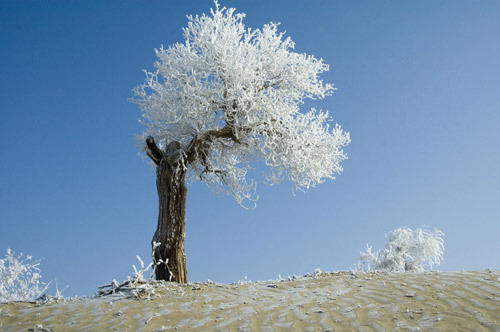 Set in the large Takla Makan Desert, Tarim River and the largest diversifolious poplar forest in China, the county is just like a miniascape of Tarim Basin. Villagers and their offspring still live in the old way - canoeing and fishing. Jingyu (Cetacean) Lake in the south is named for it is cetacean-like shape. In the east section of the lake forms a 7.5 kilometers (4.7 miles) grit dike which naturally divides the Jingyu Lake into west and east parts. There is a river feeding the east lake, while the west one is a backwater with high salt content and evaporation, without charging of freshwater. When flocks of birds fly to have a rest in the east lake, the west is mute. Hence, it was also known as Yinyang Lake. There is also a Buddhist shrine that can not be forgotten. Sitting on cliffs on the north bank of Muzat River, Kizil Thousand-Buddha Caves in Baicheng County of Aksu Region is the earliest Buddhist art treasure trove in China, even one century earlier than the Mogao Caves. All attractive sights of Korla can not be described in limited pages and should not be. The true charm of the city and places around should be learned by those who really get there. Have you prepared for the trip to Korla? It will not disappoint you.